The tendons of the rotator cuff allow the shoulder to function properly. Because rotator cuff tendons are such useful mechanisms within the shoulder, they often experience a high level of use, which can lead to degeneration with age. A rotator cuff tear compromises the overall health of your shoulder and can reduce the mobility and functionality of the arm. Rotator cuff tears generally occur more frequently in older patients. 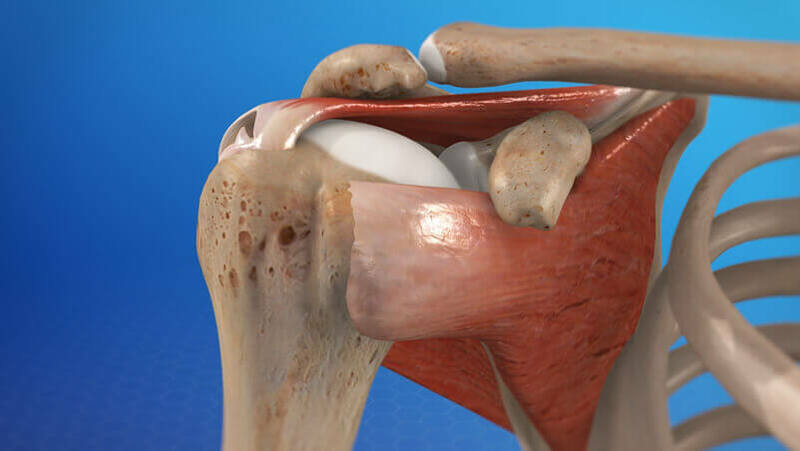 What parts of the shoulder are affected by a torn rotator cuff? The shoulder is comprised of the shoulder blade, collarbone, and upper arm bone. The rotator cuff is comprised of the tendons of 4 muscles and is designed to connect the upper arm bone to the shoulder blade. Tendons are designed to attach bones to muscles. The rotator cuff itself helps the arm to raise and rotate. When the arm is raised, the rotator cuff helps to keep the upper arm bone within the socket of the shoulder blade. The upper part of the shoulder blade, which comprises the roof of the shoulder, is known as the acromion. The bursa, which is a fluid-filled sac that reduces friction within a joint, is located between the acromion and the tendons of the rotator cuff. This bursa is specifically designed to reduce the friction between the acromion and rotator cuff. The tendons of the rotator cuff have a low supply of blood from the body, which can impede the ability of the tendons to maintain and repair themselves. Because of this lower level of blood supply, the rotator cuff tendons are more susceptible to wear and tear due to aging. Injuries as a result of degeneration typically occur in parts of the tendon that have a low blood supply and that were weakened due to wear and tear. Another common cause for a torn rotator cuff includes repetitive motion. While degeneration occurs with the combination of arm movements made in a lifetime, repetitive movements may cause shoulder degeneration to occur more quickly. This may occur in weightlifters, baseball pitchers, or patients who partake in a sport that requires the rotator cuff to be repetitively used. Finally, another possible cause of a rotator cuff tear is a shoulder injury. Weak rotator cuffs may tear if excess pressure or stress is applied. This can happen if you attempt to catch a heavy falling object, lift an object with your extended arms, or if you fall directly on the shoulder itself. It is possible that a rotator cuff tear may be minor, causing little to no noticeable pain. What are some common torn rotator cuff symptoms? Torn rotator cuff symptoms include weakness and pain within the shoulder. Limited mobility or a smaller range of motion may also accompany a complete rotator cuff tear. In minor cases of a partially torn rotator cuff, patients may experience pain but can still move the shoulder properly. It is possible that rotator cuff tendons may rupture completely, resulting in the inability to properly move the arm or raise the arm above the head. Catching, popping, clicking, or locking sensations within the shoulder are often common symptoms of a torn rotator cuff. How can Dr. Rozbruch diagnose a rotator cuff tear? Dr. Rozbruch will require additional information about your health, including medical history, current medical health, and any shoulder injuries that you may have previously sustained. A physical examination of the affected shoulder is one of the most helpful tools when diagnosing a torn rotator cuff. In cases of a complete rotator cuff tear, patients usually have a complete inability to successfully move the arm and shoulder. While a complete rotator cuff tear is often more easily diagnosed, some cases of a milder rotator cuff tear may need additional tests to properly diagnose. If additional information is needed, a shoulder X-ray may be ordered to detect the presence of any bone spurs that have formed. Shoulder X-rays can help detect a downward-sloping acromion or a lack of joint space within the shoulder. These are often common symptoms of a rotator cuff tear. An X-ray of the shoulder may also be able to determine if your shoulder pain is caused by another shoulder condition. An arthrogram test may be combined with a shoulder X-ray to diagnose a torn rotator cuff. An arthrogram uses a special dye that is injected into the joint of the shoulder. During a shoulder X-ray, this dye is easily visible. If the dye remains within the joint of the shoulder, it may mean that your shoulder pain is caused by another condition. On the other hand, when the dye leaks out of the shoulder joint, it is often attributed to a tear in the rotator cuff. What nonsurgical rotator cuff tear treatments are available? Anti-inflammatories are often the first step in treating a torn rotator cuff nonsurgically. Oral or injectable anti-inflammatory medications can help to ease shoulder pain and reduce the overall inflammation of the shoulder. Cortisone injections help manage painful shoulder symptoms. Cortisone injections for a rotator cuff tear may temporarily reduce pain, inflammation, and discomfort. Physical therapy can also increase your shoulder’s range of motion and mobility through simple exercises. Physical therapy will progress to incorporate strength exercises, which can improve the control and strength of your rotator cuff and shoulder muscles. These exercises can help teach the muscles to properly keep the humerus bone within the socket of the shoulder, which allows the shoulder to move more fluidly. Physical therapy after a nonsurgical torn rotator cuff treatment usually lasts from 1-2 months. What torn rotator cuff surgeries are available? Torn rotator cuff surgery may be needed for patients who do not respond to nonsurgical torn rotator cuff treatments. Patients with a complete rotator cuff tear will require torn rotator cuff surgery, as complete tears cannot heal on their own. Partial rotator cuff tears do not always require torn rotator cuff surgery. Dr. Rozbruch can help you decide if you would benefit from rotator cuff surgery. If rotator cuff surgery is suggested, Dr. Rozbruch may order a shoulder arthrogram or shoulder MRI scan to help prepare for your shoulder surgery. These shoulder exams can help to determine the condition of your shoulder and reduce any unforeseen complications during your surgery. If your torn rotator cuff is the result of an underlying shoulder condition, Dr. Rozbruch may address this condition during your rotator cuff surgery. 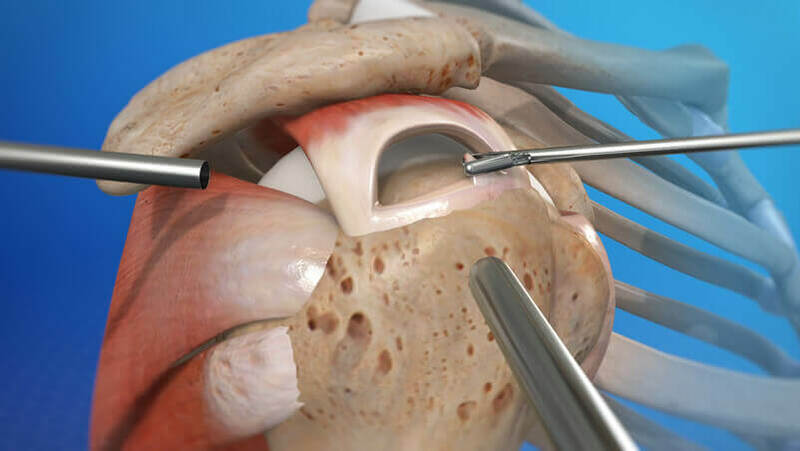 Some of the most common torn rotator cuff surgeries include acromioplasty, shoulder debridement, arthroscopic rotator cuff repair, open rotator cuff tear surgery, and rotator cuff grafts. For a minor rotator cuff tear, acromioplasty can help repair a torn rotator cuff. Acromioplasty may involve shoulder debridement and acromioplasty. During acromioplasty, Dr. Rozbruch can cut and reshape the end of the acromion to alleviate pressure from the rotator cuff tendons and create adequate spacing. Acromioplasty is often only used in cases of a minor torn rotator cuff. A rotator cuff tear at the top of the rotator cuff tendons may also need to be addressed during acromioplasty. Minor rotator cuff tears may successfully be treated with shoulder debridement, which uses an arthroscope to remove any damaged, unhealthy, or worn portions of the tendon. Arthroscopic rotator cuff surgery is typically less invasive because it requires a smaller incision than open rotator cuff tear surgery. Following shoulder debridement, the remaining healthy tissue of the tendon will begin to heal itself again. An arthroscope is a small tube with a camera at the end that can be used during rotator cuff surgery. The arthroscope is gently inserted through a small incision in the shoulder. The images from an arthroscope are shown on a monitor during surgery. This gives Dr. Rozbruch a live view of your shoulder without needing a larger incision to view the structures of the shoulder. During arthroscopic rotator cuff repair, Dr. Rozbruch will remove any damaged or unhealthy tissues from the rotator cuff. The top of the upper arm bone is then prepared for the tendon to be reattached. He will remove the outer layers to create a bony area. Small holes are made within the upper arm bone where sutures can be placed. The tendon is then repaired and stitched to the upper arm bone with sutures that circle through the holes. These devices are known as suture anchors for rotator cuff surgery. With time, the damaged tendon will heal and attach to the upper arm bone. In more severe cases of a torn rotator cuff, open rotator cuff tear surgery may be required. Open rotator cuff tear surgery cannot be performed through an arthroscope and requires a larger incision to be made so that Dr. Rozbruch can see the internal structures of the shoulder. Once an incision is made, he will begin to gently separate the tissues and structures of the shoulder until the rotator cuff is viewable. Once the rotator cuff has been repaired, the muscles will then be placed back in their natural position, and sutures will be applied to the incision. If a rotator cuff tear cannot be repaired through other torn rotator cuff surgeries, rotator cuff grafts may be required. Rotator cuff grafts may be needed in patients who have had a rotator cuff tear for a long period of time. If a patient has had a damaged rotator cuff and has not undergone rotator cuff tear surgery, the surrounding muscles may constrict and can no longer be reattached properly. In cases like this, rotator cuff grafts or tendon grafts may be needed to bridge the distance between the torn rotator cuff and upper arm bone. What should I expect after a torn rotator cuff treatment? Following a rotator cuff treatment, physical therapy can help ease pain and increase shoulder mobility. Your physical therapist will be able to create individualized exercises to treat any symptoms you may have. If you experience a limited range of motion in the shoulder, your physical therapist can create a plan that will slowly help improve shoulder mobility. Physical therapy for a torn rotator cuff can also help you reduce the possibility of future injury. What should I expect after a torn rotator cuff surgery? A protective shoulder sling may need to be worn to protect your healing shoulder. Following torn rotator cuff surgery, physical therapy may progress more slowly and may be more frequent. Typically, physical therapy may be needed for the first 2-3 months following rotator cuff tear surgery. Full recovery may take up to 6 months. It is important to start moving the shoulder as quickly as possible following rotator cuff surgery, but it is even more important not to do too much activity too fast. Physical therapy can help you find the right balance of light exercise and rest to promote a healthy shoulder. Initial physical therapy sessions will be most concerned with reducing pain and inflammation. Physical therapy after arthroscopic shoulder surgery generally progresses more quickly than therapy after open rotator cuff surgery. With rotator cuff surgeries where the muscle has been severed or cut, physical therapy progresses more slowly. Passive exercises are often the first activity your physical therapist will introduce. Passive shoulder exercises involve your arm being gently moved so that your shoulder is engaged, but your muscles are relaxed. Strength exercises are used to increase mobility, range of motion, control, and strength within the shoulder. At the end of your physical therapy sessions, your physical therapist will teach you exercises that you can perform on your own. How can I learn more about a rotator cuff tear? To learn more about a rotator cuff tear, please request an appointment online or call Dr. Rozbruch’s orthopedic office in NYC at 212-744-9857. Prior to an office visit, please fill out Dr. Rozbruch’s patient forms to expedite your first visit.